Really great carpet. The real thing the the photos are a perfect match. Seems to be good quality. I was a little concern with lumps at first but within a couple days it flattened out. Very happy with the rug. 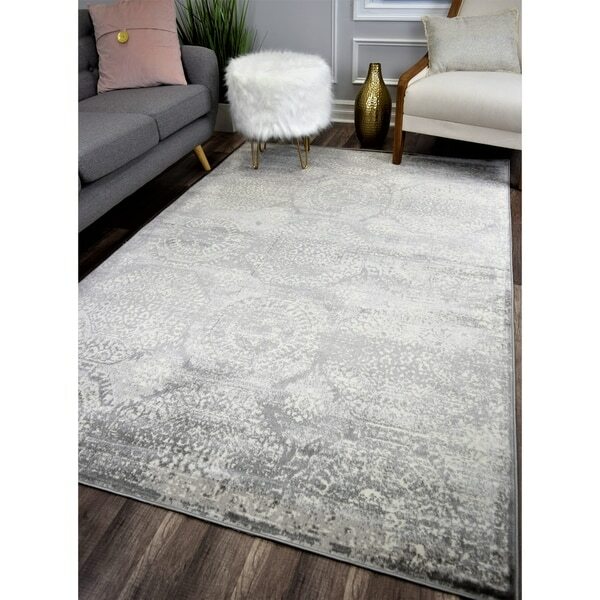 Pull your room's décor together with this exquisite rug. Its motif is a sought after blend of classic and chic. Crafted from polypropylene and polyester, this silver-hued stunner is designed with a short pile that boasts durability and a soft touch. Made in the transitional style, this home accessory powerhouse will work beautifully in both traditional and modern spaces. "how thick is this rug?" This rug is approximately half an inch thick.